Engineers have known for some time that if cars could only "talk" to each other, they could avoid a lot of accidents. Vehicles could be driven more safely with information about another car, obstacle or pedestrian around a blind curve, for example. 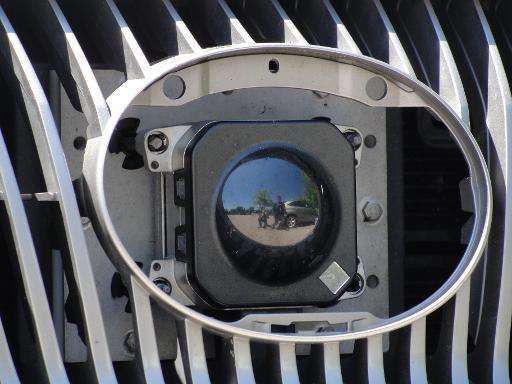 But the hurdles to implementing these systems are numerous: they require a legal framework and the allocation of wireless spectrum to enable vehicle-to-vehicle (V2V) communications. The US administration announced this month it was speeding up efforts to promote V2V in a push for better road safety and to help facilitate the self-driving cars which are on the horizon. Transportation Secretary Anthony Foxx said during a visit to Silicon Valley that he hopes to have regulations for these technologies by the end of the year. 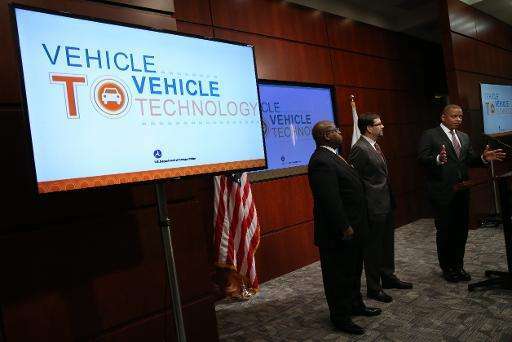 "We're accelerating our timetable on a proposed rule that would require vehicle-to-vehicle—or V2V—technology that allows cars to 'talk' to one another," Foxx said. "And it is something that we believe can have a huge impact on preventing accidents from ever happening—and in helping us eventually produce a car that can drive itself better than a human can." The National Highway Traffic Safety Administration, which has been testing V2V since 2012, said the technology can accomplish a number of things such as determining if a car can safely make a left turn across traffic by calculating the speed of oncoming vehicles, whether it is feasible to overtake another car and if it is safe to enter an intersection with limited visibility. Researchers say systems which cost around $350 per car can avoid 592,000 accidents and save 1,083 lives per year, if the fleet of US cars is equipped with the technology. But reaping benefits will take time: Even if the technology is mandated on new cars, it will take years until older vehicles are replaced and for infrastructure to be upgraded to be part of the system. The Association of Global Automakers, which represents non-US manufacturers including Honda, Nissan and Toyota, welcomed the effort by Washington to speed up the process. "The faster we move toward deployment of V2V communications, the sooner consumers will receive the benefits of this lifesaving technology," said John Bozzella, president and chief executive of the group. One of the issues regulators face is setting aside part of the wireless spectrum, amid a crunch due to the surging use of smartphones and tablets. Any system must be vetted through the Federal Communications Commission which allocates wireless spectrum to ensure communications go smoothly. 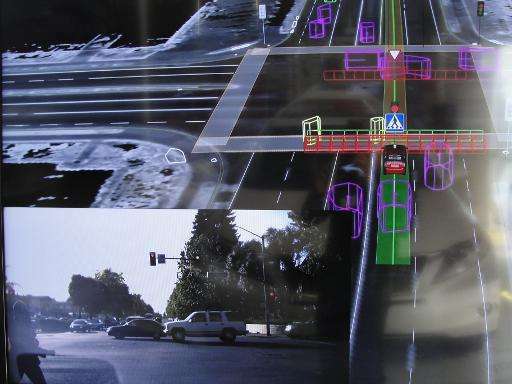 But aside from the technical issues, vehicle-to-vehicle communications could be held back by debate over issues of legal liability if something goes wrong and by privacy questions about the creation of a new database. Randal O'Toole, a senior fellow at the Cato Institute, a libertarian think-tank, said it would appear to be positive if a broken-down vehicle sends out a signal that allows motorists to take a different route to avoid congestion. "That sounds good, but what happens when someone hacks the system and puts out radio signals in a hundred or a thousand critical urban intersections that effectively shut down traffic in an entire city?" O'Toole said in a blog post. He added that with a system dependent on cars talking to other vehicles and to road infrastructure "the government could decide you have driven enough and simply shut off your car." This is possible now with OnStar equipped vehicles. The single minded drive to automate and roboticize vehicles and our roadways is troubling and difficult to understand in any context other than the creation of another revenue source for manufacturers. As the article noted, automated roadways are subject to malicious attack and even simple failure of such systems can be catastrophic once they become common. Cars which drive themselves even partially represent another source of danger on the roadway. A self braking car, for example, can brake when braking is a bad activity. Issues of liability remain as do issues of privacy and intrusive databases of the movement of individuals. There should be dialog, calls for caution and resistance. V2V will be like every other move on car safety - opposed on various grounds by traditionalist drivers. Doubtless there will be legal and technical teething troubles but nothing that can't be solved. The other interesting one is that it's not only the US looking at this stuff - it will be a lot cheaper for everyone if Europe, China, whoever, US agree common standards. Why can't V2V be all about safety, and nothing about shutting down cars? As far as I have understood, the V2V systems now being investigated warns other cars when a collision is imminent. Why do you have to add a remote shut off to this system? I don't get it. Why would it be necessary to put these systems on line? I would be perfectly happy to have a fixed SW in my car, and also perfectly happy with the miniscule risk that someone stole my car. The anti collision systems in ships are not online, so why would you insist on it for cars? Of course I know that car thiefs sometimes go on a wild spree and the police would like to have the choice to shut these cars down before someone gets hurt. But, I would rather live with that minor risk than to have my car be subject to constant surveillance.